This super easy brunch food recipe makes a perfectly creamy quiche Lorraine. This classic French dish is a wonderful make ahead breakfast idea. Everyone will love the rich bacon and flaky pie crust! Several years ago, a close family friend started giving me French cooking lessons at my home. Although we made a lot of great food, one of my favorites was the first recipe we made: quiche Lorraine. This creamy savory tart is easy and quick to make–plus so good, you’ll want seconds! Why is it called a quiche Lorraine? Quiche Lorraine is an open-faced savory tart named after the Lorraine region of France. Where is quiche Lorraine from? Quiche Lorraine is from France. If you’re feeling witty, you could say that it’s from your kitchen! What is quiche Lorraine made of? Quiche Lorraine is made of just a few simple ingredients: eggs, milk or cream (or a combination of the two), bacon, salt, pepper, nutmeg, and pastry. Please note that traditional quiche Lorraine does not contain cheese. Trust me, you won’t miss it in this recipe! This recipe for quiche Lorraine comes in at 281 calories per slice. All the ingredients are natural, and are healthy in moderation. You can cut the calories to 155 and the carbs to 2g per slice by omitting the pastry. Which pastry do you use for quiche Lorraine? I recommend using a traditional pie crust, such as flaky shortcrust pastry. The French call this type of pastry pâte brisée. Should pie crust be pre-baked for quiche? Yes, the pastry should always be pre-baked before adding the egg filling. This step is called blind baking, and is crucial to avoiding a soggy pastry base. You can learn this easy technique with my photo tutorial. Can I use milk instead of cream for quiche? Yes, you can use milk instead of cream in a quiche; just realize that the quiche won’t be as luxuriously rich and creamy. If you must substitute milk for the cream, be sure to use whole milk for a higher fat content. I use equal parts cream and milk in my recipe for the best of both worlds. What do you serve quiche Lorraine with? Can I make quiche Lorraine ahead of time? Yes, you can make quiche Lorraine ahead of time. It’s best to blind bake the pastry and mix up the filling, then bake the quiche right before you serve it. A fully baked quiche doesn’t taste as good after refrigerating and reheating. Tightly cover the quiche with plastic wrap or aluminum foil and refrigerate for up to 5 days. Did you make the pastry and filling ahead? Store the blind baked pastry covered at room temperature and the filling covered in the fridge. Bake within 48 hours for best freshness. Cover the quiche with a piece of aluminum foil to prevent browning. Bake at 325 F for 15 minutes, until hot. If you’re baking the quiche straight from the freezer, increase the baking time to 30-35 minutes. Bake until the center of the quiche has an internal temperature of 160-165 F on a meat thermometer. If you’re in a pinch and have to use the microwave, let the quiche come to room temperature, then microwave on 50% power for 3 minutes. Can quiche Lorraine be frozen? You can freeze quiche Lorraine before or after baking it. Freezing Before Baking: flash freeze the quiche for a few hours until firm, then seal tightly in a zip-top freezer bag and freeze for up to 1 month. Freezing After Baking: seal the quiche tightly in a zip-top freezer bag and freeze for up to 1 month. Don’t thaw the quiche before baking or reheating it. Grab the ingredients: eggs, milk, cream, bacon, salt, pepper, and nutmeg. Blind bake the pastry shell and cook the bacon in a cast iron skillet or the microwave. Crumble the bacon into small pieces and scatter in the pastry shell. Whisk together the egg, milk, and cream until smooth. Blend in the salt, pepper, and nutmeg. Pour the filling into the pie shell on top of the bacon. Bake at 375 F for 30 minutes, until a knife inserted into the center comes out clean. The quiche should be puffed and browned. Always blind bake (pre-bake) the pastry before adding the egg filling. Freshly grate the nutmeg and grind the pepper for the best flavor. Don’t use skim, 1%, or 2% milk for making quiche. The more fat in the dairy, the better the quiche will set. Lighten up the quiche by using half cream and half whole milk. If you don’t care about calories, feel free to use 100% cream. Be careful not to overbake the quiche. This makes it tough and dry. The recipe below is adapted from Mastering the Art of French Cooking (Volume 1) by Julia Child, Louisette Bertholle, and Simone Beck. Looking for more delicious brunch ideas? Here’s some tasty ones! Caramelized Onion and Gruyère Tart: a richly flavored quiche that has been a family favorite. 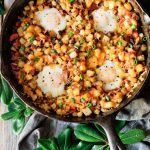 Skillet Breakfast Hash: creamy eggs, crispy potato cubes, and colorful veggies all in one skillet. Cheese Grits Casserole: this crowd-pleasing Southern breakfast recipe can be made ahead. The pleasure of a 5-star review for this quiche Lorraine recipe would be greatly appreciated. Roll out the pastry on a lightly floured surface to 1/8 of an inch thick and use it to line a loose-bottomed 9-inch tart pan. Prick the base of the pastry all over with a fork and chill in the fridge for 15 minutes. Blind bake the pastry at 400 F for 10 minutes with parchment paper and beans to weigh it down, then remove the paper and beans and bake again for about 5-8 minutes. The pastry should be shrinking away slightly from the sides of the pan and lightly browned around the edges. Lay the bacon slices in a 10-inch cast iron skillet and set over medium-high heat. Once the bacon begins to sizzle, turn the heat down to medium and cook until crispy, turning the bacon with a fork. Drain the bacon on a paper towel-lined plate and pat off the excess grease with a paper towel. Tear it into small pieces and evenly distribute them over the bottom of the pastry. Whisk the eggs, milk, and cream together in a medium bowl until blended. Mix in the salt, pepper, and nutmeg. Pour the filling into the blind baked pastry and bake for 30 minutes at 375 F until a knife inserted into the center comes out clean. The quiche should jiggle slightly in the middle when shaken, and the top should be golden brown. Be careful not to overcook. Let the quiche cool for 5-10 minutes in the pan, then remove it from the pan and place on a serving plate. Serve warm. The pleasure of a 5-star review of this quiche Lorraine recipe would be greatly appreciated.